When the civilian population returned after the Great War the villages, towns and landscapes they had known were reduced to rubble or a mass of shell holes. In the immediate post-war period no-one lived in any of the villages around Ypres; during the day the people returned to their communities to salvage and begin the rebuilding process and at night they slept in Ypres. One writer described the ‘ghostly silence’ on the battlefields after dark, in stark contrast to the war years. This image from 1921 shows an old railway sleeper track running through what had been Chateau Wood, close to the hamlet of Hooge on the Menin Road. 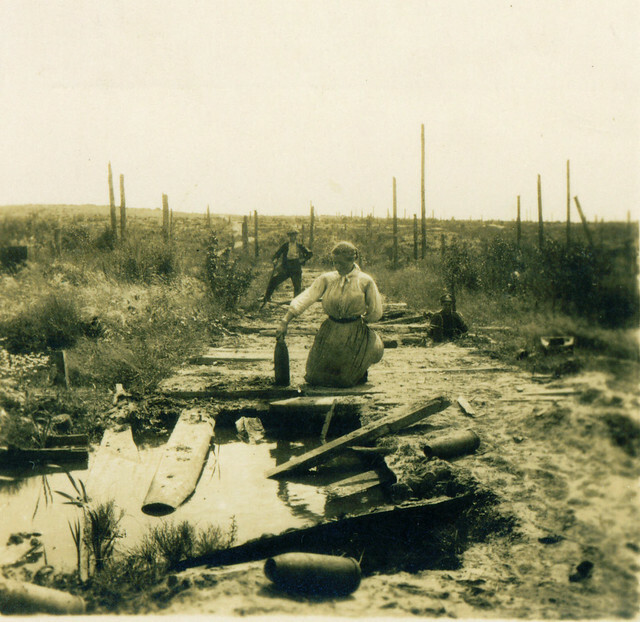 The overgrown by devastated nature of the ground is obvious, and the destritus of war not far away; several shells are visibile, all minus their copper driving bands and brass fuses – quite likely removed by civilians like those in the photo trying to make a small living from the scrap. In most battlefield areas the serious rebuilding did not begin until 1922/23, which meant that the people in this photograph lived a very primitive existence, often in old wooden army huts, for several years until their shattered communities rose from the ashes. This entry was posted on 27/01/2012 by sommecourt. It was filed under Battlefields, Flanders, Great War, Western Front, WW1, Ypres and was tagged with Battlefields, Flanders, WW1, Ypres. Odd, Two men are in blast distance away while a woman, who seems to be missing a left limb does the dirty work on her knees or legless stumps?